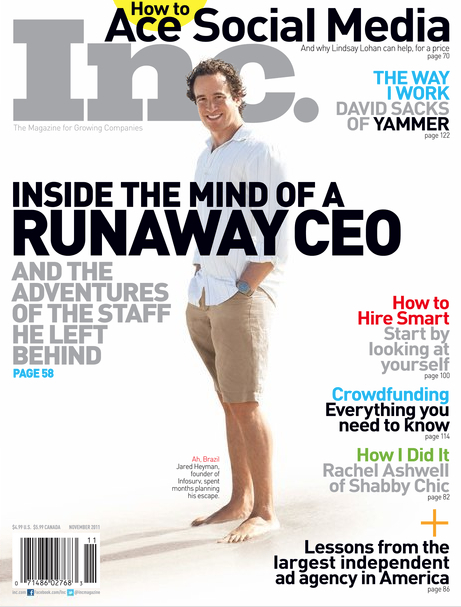 For any entrepreneur, it’s a great joy to see his photo on the cover of Inc. magazine. Inc. is a publication that I’ve been reading for many years, as have over 700,000 other entrepreneurs and aspiring entrepreneurs. In July 2010, I left Infosurv to pursue a life-dream and embark upon an around-the-world traveling sabbatical. I allowed an Inc. magazine writer to follow my adventure and that of my company’s executives back in Atlanta with dozens of interviews via telephone, email, and in-person. Finally, after much quiet anticipation, I got to read the final article about our dual adventures in the November 2011 edition of Inc., currently available on newsstands across the US. I’m glad that Inc. could capture in words and photos this critical transition in the history of Infosurv. When I left the company last July it reached a new level of maturity, moving from founder-driven to professional management-driven, a leap that not all companies navigate successfully. Without my day-to-day involvement, new leaders emerged in the organization and exhibited a level of independence, motivation, and creativity that I consider inspirational. A special thanks and congratulations goes out to Carl Fusco, our Managing Director, and the other 3 members of our talented Leadership Team: John Barrett, Kyle Burnam, and Kevin Wilensky. Not all companies thrive and drive forward, as Infosurv has, after the exit of its founder. This has only been possible with a gifted executive team who respects the values I instilled in the organization while not being afraid to exert their individual styles and philosophies. Of course there are times when our styles differ, as the Inc. article highlights, but I respect those differences and encourage my executives to lead in the manner that suites them best. Autonomy and accountability go hand-in-hand. If you left the Inc. article with the impression that a tension exists between me and Infosurv management, I’m sorry to say that the truth is much less exciting. Several out-of-context quotes and personal impressions were inserted to give that impression, but it’s a journalist technique to add drama, not reality. The primary goals of my sabbatical were to travel, unwind, and reflect upon the next steps in my life and career. The sabbatical was an unequivocal success thanks to my trusted team back in the office, giving me the confidence to “check out” both physically and mentally. This is a luxury that few entrepreneurs can enjoy, and for this great gift I will be forever grateful. It’s my hope that our story will serve as an inspiration, both to entrepreneurs who feel ready to step away from their companies and to professional managers who feel ready to take their reigns. Unfortunately the Inc. article didn’t included any detail about the dramatic changes made within the company in the years prior to my sabbatical to facilitate its success: creating a strong leadership team, solid culture and values, clear metrics and accountabilities, and a formal strategic planning process. If you have questions about any of these please feel free to ask. If there’s sufficient interest I’m glad to devote future blog posts to these topics or whatever else interests my readers. Thanks for visiting ChasingSummer.net and best of luck accomplishing your own dreams, whatever they may be. You are living the dream, and I admire you greatly! I’m 30, have a good job (that I hate), am about to pay off my house, be completely debt free, and am working on trying to start several businesses that would allow me to do what you’ve already done. If you have any advice outside of cliches….please share! If not, congratulations and I look forward to reading more of your blog. Congrats on getting out of debt and paying off your house, those are very freeing steps. If you decide to be an entrepreneur, I can’t over-emphasize the importance of focus. I would recommend starting one business at a time, only moving on to another once it’s either 1) definitely a failure or 2) definitely a success. It’s a common misconception that brilliant businesses come from brilliant ideas. The truth is that brilliant business come from brilliant execution. If you spread your attention across multiple businesses at once you’ll execute poorly on them all. Best of luck to you! Thanks for the advice Jared. If you get your entrepreneurial juices flowing again and need some associates….I’m in! Congrats again. Jared, beautifully done. You *are* inspiring entrepreneurs (like me) and have been for YEARS. It’s a privilege to follow your journey. Maybe those of us who are inspired should be a little less quiet about it–YOU ROCK! I started working as an editor of meat tax for 25 years. I became interested in technology and became a professional in the field. Not happy, I made a graphic with my brother and a partner for 10 years. The membership of the company, which was my father and my uncle was not right. With this, resovelmos open another company, I and my brother in the area of ​​public management in partnership with Microsoft, where he was a success, and in two years we have 90 contracts, and revenues of $ 200.000/month. After that, my uncle decided to get out and just become a member, along with my brother, my father’s company. But I’m a little tired, aged 40, married with two children, and have started my activities 15 years, and before embarking on this new activity here in the new company, I feel the need to know the world, take time to my head and feel that that is exactly what I want for my life. Reading his testimony, gave me an urge to run this desire, leading to family, but not to be traveling, as I am concerned with studies of children, but to live a different life, discovering the unknown. My only problem is to find these professionals and that you have found your “coverage” within my father and my brother. Do not know if this would have the same success. Even so congratulations on your courage. Sorry about the english. I´m from Brasil and it´s is another thing what i want. Learn english. Your story is inspirational, Jared, and congratulations on all that you’re doing! I’ve been travelling and working a month at a time in different locations around the world and have lived a year at a time in other countries … so I also know spending extended time living elsewhere is always an amazing growth experience. Enter your email address to subscribe to this blog and receive notifications of new posts by email. Don't worry, we hate spam too.